Lacking that happy knack of making friends easily? If you are asked to a party, do you stand around like the proverbial wallflower while everyone else is engaged in happy conversations and the sound of everybody else%u2019s laughter fills the room? Or maybe your career is stuck in a rut and you see no way to make that break for yourself to get ahead? If you think, %u201CThat%u2019s me!%u201D about any of these, then maybe the answer lies in a lack of self-esteem and the following will help%u2026. First, start a warm bath running and drizzle some of the lavender oil into the water. Next light both candles and sit them near the bath. Float the leaves in the bath and climb in. Breathe in through your nose and hold it for a count of seven. Breathe out through your mouth for a seven count. Repeat this process six more times. As you breathe in, visualize your lungs filling up with warm, golden light. As you breathe out, see your frustrations in your breath and watch your anger, pain, and all of the other barriers that stand in your way float away with each exhalation. Now, totally relaxed and at ease with yourself, visualize a spot of golden light above you. Watch it get bigger and bigger before it floats down and your body is enveloped in its warm glow. %u201CI have a contribution to make. I have words to say. Let others hear the words I speak. Repeat these words six more times before leaving the bath and snuffing the candles. Thread the oak leaves onto the string and then hold them up to the light and repeat the previous verse one last time. Fold the leaves into the envelope and place the envelope into your handbag or wallet. End the ritual by burning the jasmine oil in the burner and letting the scent of it waft over you, removing any last traces of self-doubt. 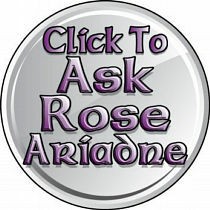 Rose Ariadne: Providing â€œMagickalâ€ answers to your Pagan, Wiccan, Witchcraft spell casting questions since 2006.